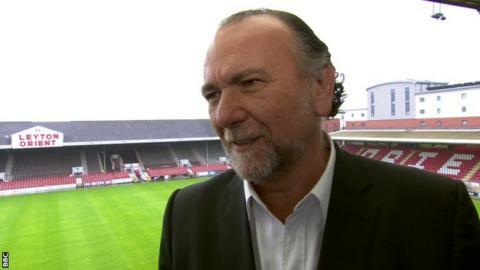 Former Leyton Orient defender Matt Lockwood has urged O's owner Francesco Becchetti to appoint a manager who has experience in England. Orient sacked Italian boss Fabio Liverani last week, following their relegation from League One. "I'd love for the owner to stick with a British-based manager," Lockwood, 38, told BBC London 94.9. "Orient could be a great club but the owners need to employ people who know England and the lower leagues." Former Italy international Liverani, 39, became Orient's fourth manager of the season in December when he replaced compatriot Mauro Milanese. Liverani was unable to save the east London side from dropping into the fourth tier for the first time since 2006, and left the Matchroom Stadium by mutual consent despite having two years left on his contract. The O's endured a turbulent season after Italian businessman Becchetti bought the club from Barry Hearn last summer. Lockwood, who scored 56 goals in 386 appearances for Orient between 1998 and 2007, believes Orient need to retain a British influence at the club. "It is a fantastic club with owners who have got a lot of money," he said. "If they listen to advice for what English clubs - and particularly Leyton Orient - need, they will be very successful. "With the money they've got and the budget they will have in League Two, they should win that division by March. "From what I've heard they want to do it their own way. "You just hope, for the sake of the players and fans at Orient, that what Becchetti wants to do - however strange it might seem - could potentially work."